Hey design guys!... A cool selection of the recent banner signs printed for industry here. Materials shown are vinyl, poly cloth fabric mesh, banner, fence, event and some display trade show graphic printing. Their website is made by designers for designers. It's practical and very well price orientated for 3rd party on-sellers. Firms can order without an account and the customer details are only used for shipping labels. Signs Banners Online are the best wholesale and factory to you printing service for signs and banners. As used by graphic designers, screen printing companies, signage and display companies, they supply direct from the factory and as a professional graphic designer firm is it easy to use their 'auto upload' system for immediate printing. So if you need your banner signs today tomorrow or upcoming trade show graphics, you can manage all your graphic printing online with them. Another cool feature of https://www.signsbannersonline.com is that you can input your selections and quantity for genuine 'estimate quotations' or continue to firm order. As you input large sizes or custom quantities their system 'wholesales out' the price and shows you the lowest discounts first. As a graphic designer, I love that because I know how best to order for my customers expectations. LARGE sizes and CUSTOM sizes are now ok to order as they specialize in big banners custom designs and 'to you' systems. You can manage it all from your desk. The large contractor signs on the fence show how grand format printing onto their mesh banner looks and the top clarity it resolves. Other closer photos also have pinpoints showing the properties for the banner. There are many banners and signs now available as custom make so if you are ok to produce the art design I recommend Signs Banners Online for your clients too. They have also developed many new leading technologies and automatic sewing techniques for manufacturing high quality low cost signs and banners. Talk to them on Live Chat for more or visit their website for your key marketing opportunities. 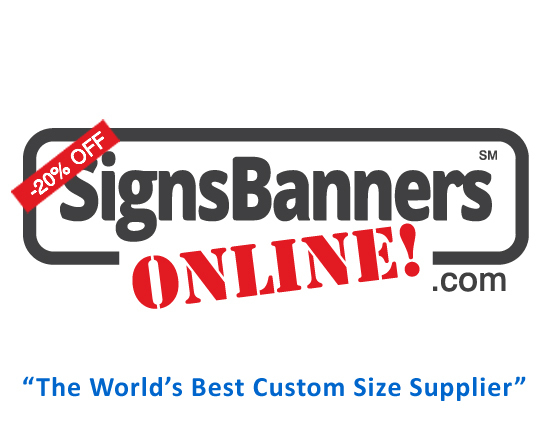 Short term or recurring promotional store advertising you can see how they 'bulk' manufacture custom large banner signage for many US and now help international customers all over the world with more options and low cost signs.